Welcome back friends. It's a very exciting day today! The 2017 Occasions Catalog and 2017 Sale-A-Bration Catalog goes live. Woohoo new products! So contact your friends, family, co-workers, neighbors and whoever you think that would be interested in crafting together to stamp. Do you have crafty ideas you want to create? Any New Years resolutions about creating or sending cards out to loved ones? As your Stampin' Up! demonstrator I'm here to help. Tell me what date works for you to host a workshop, or maybe you prefer a class or just a stamping date with me. Today I'm sharing a stamp set from each catalog from Occasions and Sale-A-Brations Catalogs. First up was the Sealed With Love stamp set (Occasions Catalog) which is all about love, hearts, valentines day and has matching framelits. The second one is Delicate Details (Sale-A-Bration Catalog) that had various lace patterns. I combined both sets to come up with a Valentine's Day card. There is a subtle lace image stamped under the Real Red and Blushing Bride pieces. I love the layered ribbon look and how patriotic it looks too! Not sure if you saw the layers on the sentiment piece. I have the stamped sentiment on a stitched circle which is on top of a Real Red scallop circle all attached on top of the new Lace Doilies. These are a MUST to be added to your shopping cart or wish list. These are great and I hope they stick around long after the catalog ends. They are Whisper White on one side and Very Vanilla on the other. What more could you ask for? 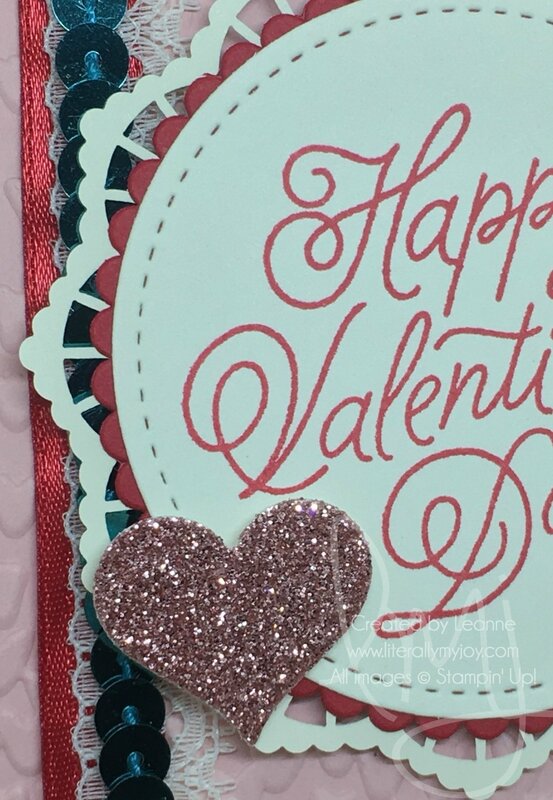 Traditional Valentine's color pink and red but thought a hint of Bermuda Bay would be fun.